With funds from a new lodging tax, the McMinnville City Council approved a grant to the MDA (McMinnville Downtown Association) for a 2015 wine and culinary tourism marketing campaign. Creative Company was chosen to provide strategy, creative and implementation. 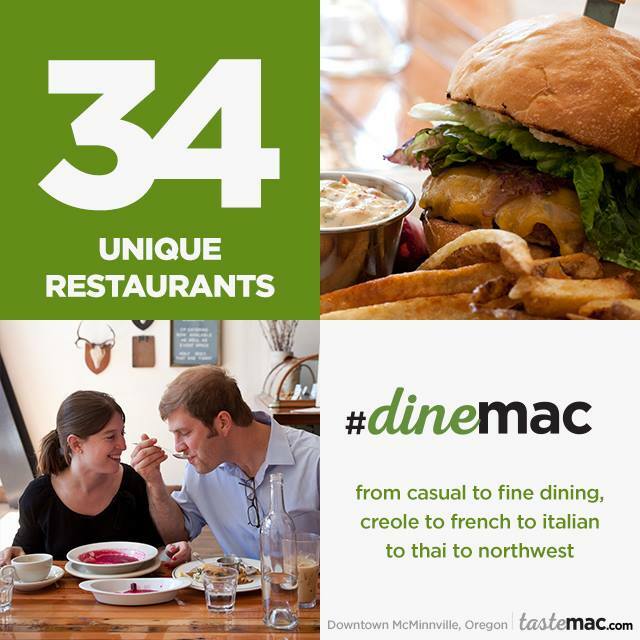 The integrated campaign launched in March, 2015 with a new website at tastemac.com and a full page ad in a local publication. Known by locals as “Mac,” McMinnville was already receiving great press. The numbers said it all. Our goal was to showcase “what’s in it for me?” from the visitor’s point of view. We wanted to reach people in McMinnville and entice the right kind of visitors–those looking for an exceptional food and wine destination. 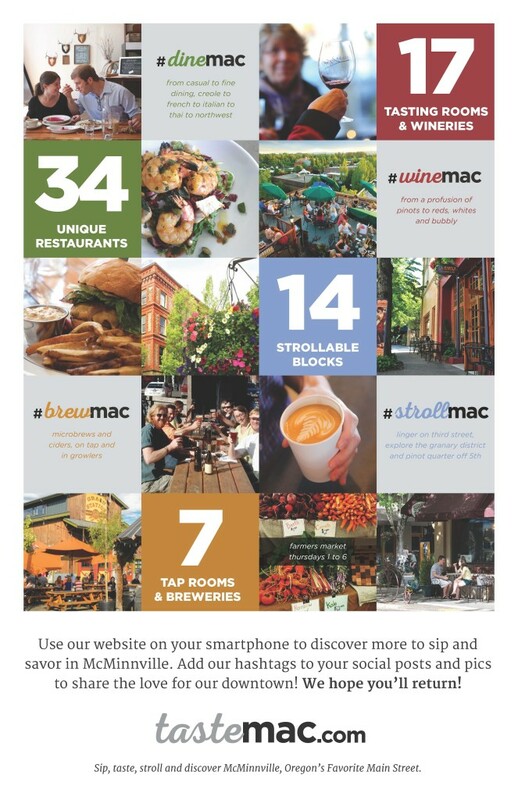 We planned and designed a regional magazine advertising campaign for March through December, 2015; social media on Facebook, Twitter, and Instagram with the hashtags #tastemac, #winemac, #dinemac, #brewmac and #strollmac; and an online AdWords campaign to drive interested visitors back to the mobile-friendly website. We considered what we could put in people’s hands and messages to tie print ads into the online experience. We also provided marketing tools to campaign participants so they could promote Taste Mac directly to their visitors. As a critical point of choice for those already in town or those seeking an exceptional food and wine destination, the website was the center of the strategy. 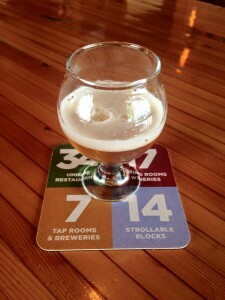 Every downtown food spot, wine or beer place has a listing on the website which links from a photo of their sign to details about location, menu, pricing, more. A visitor can click on their choice and map themselves quickly to what they’re looking for. AdWords from March through November drove traffic from out of the area to the website. 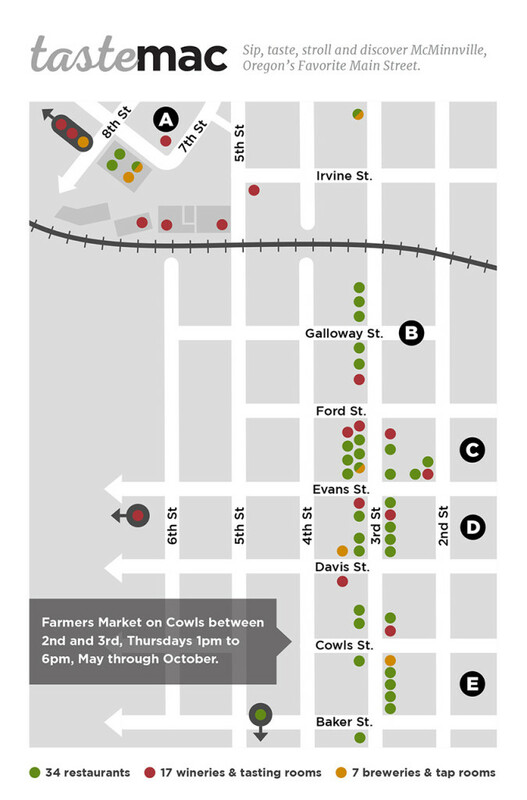 A simple map was designed for the rack card and placed on the website to quickly show how many choices line Third Street and the Pinot Quarter. The website includes a “stroll” page with photos of downtown. A compilation of the many outstanding reviews of McMinnville adds more detail. The site helps travelers understand why they’ll want to stop in McMinnville on the way to the Oregon coast, make Mac a weekend destination, or linger for a week. After all, it will take more than a day to sip, taste and see everything in McMinnville, Oregon’s Favorite Main Street. 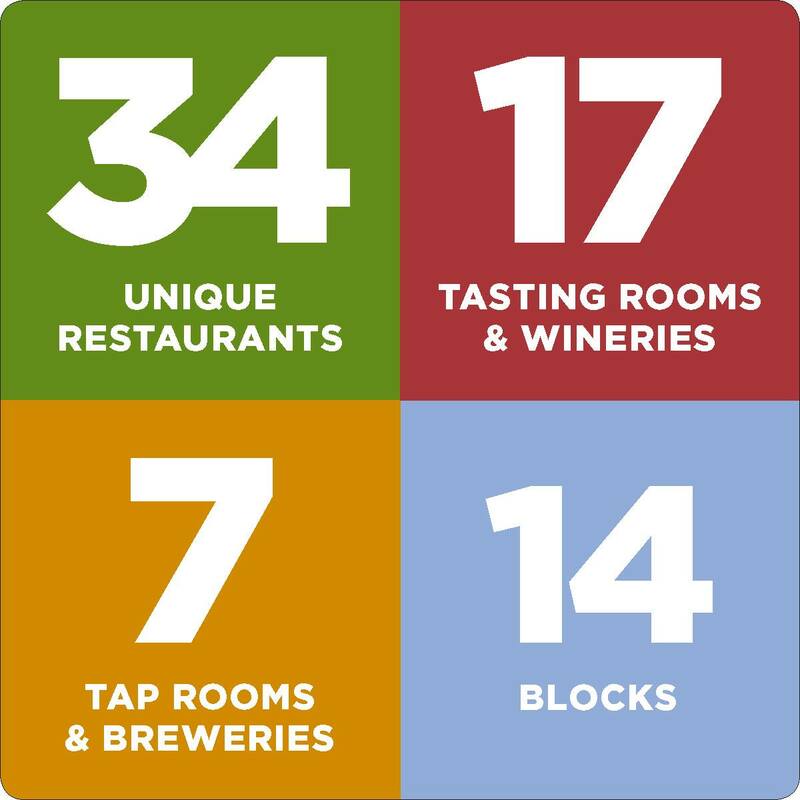 The tourism marketing campaign focused on the impressive numbers highlighted in large blocks of color—34 unique restaurants, 17 wineries and tasting rooms and 7 breweries and tap rooms in 14 blocks. Ads and printed pieces use the bold color blocks to grab attention and show easy access to excellent spots to dine, wine, brew and stroll. Appealing photos of food, wine, eateries and the charming streetscape help tell the story online and in print. Quotes from the enthusiastic reviews McMinnville has received were the focus of copy on each ad. Publications were chosen for their reach to high-end audiences seeking upscale dining and wine tasting. Choosing well-designed publications with a long shelf life also extended the reach and impact of the ad campaign. An 11 x 17 poster was placed around town to encourage visitors to use the website and remind them of wine, dine and brew choices in McMinnville. Locally posters line famed Third Street, coasters emblazoned with the hashtags and website and static clings in store and restaurant windows remind locals and visitors of the 58 places they should try. Tasting rooms, restaurants, breweries, coffee shops and retailers along Third Street and in the Granary District and Pinot Quarter all encourage visitors to use the tastemac.com website to discover new spots for dining, wining and enjoying a brew or two. Visitors were already arriving in McMinnville. We wanted to give them the tools and information to make the most of their experience. The website and campaign compiled useful details into one easy-to-use tool. Viewing and choosing a place to dine or taste wine was simplified. Locals have found huge value in the information compiled on the website and the simple way to find details. We’re thrilled with the response we’ve seen from this comprehensive tourism marketing campaign. The visitor numbers, buzz and continued accolades have proved our strategy worked. With our office located in McMinnville, we’re big fans of the many excellent wine, dine and brew options we have to explore. And we’re happy to continue our “homework” as new spots open! The community is supportive and enthusiastic about all McMinnville has to offer. We’re certain this is tourism marketing at its best … simple, bold, enticing, easy to see and a big “wow!” for visitors, locals and users. What do you think? You can download a case study of the TasteMac campaign here. Or talk to us if you’re ready for a clean, direct and powerfully designed tourism marketing campaign!